Fuska is the most popular street food in Bangladesh. I bet that every Bangladeshi, who lives in abroad, misses its unique spicy, sour, crispy taste. But we can easily make it at home and enjoy the deshi flavour in abroad. It is a bit long process, if you make the Fuska shell before, it will be less hustle. Only one thing (Talmakhana) will be hard to get in abroad. You can bring it from Bangladesh. Even you can buy readymade Fuska shells from Indian grocery. But I always prefer homemade one. 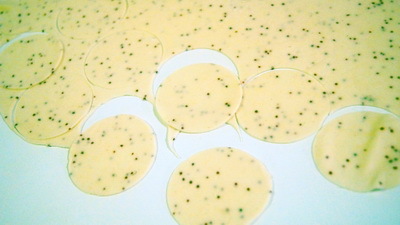 1.First soak Talmakhana in water for 10-15 minutes, then dissolve salt with Talmakhana’s water, flour and semolina. Knead properly and make smooth dough. 2. Divide the dough 6 equal balls and roll ball into flat thin bread. 3. Now cut the bread with cookie cutter. Roll rest of balls same way. 4. Place fry pan on medium heat. Don’t make oil too hot. Fry the fuska shells on medium heat otherwise the shells won’t be crisp. 5. Soak peas over night and boil with salt. 6. Drain peas and mix potato, roasted cumin, chillies, coriander, onion and black salt. 7. Soak tamarind half hour with one cup water. Fry the chillies and crush them. 8. Add crushed chillies, salt, cumin powder and sugar in tamarind water. 9. Now make hole in fuska shells and insert peas stuffing there. Make 8-10 of them and serve in a plate along with tamarind water. 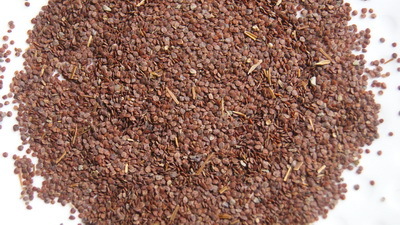 Talmakhna is basically used for making Fuska. You can only get it from Bangladesh. I will post soon fuska recipe without talmakhna. but traditional it is a must ingredient for it. Talmakhana makes Fuska crispy and short crusty For it fusha just breaks into fine pieces without hurting your mouth. I will soon post Fuska without talmakhana but I will prefer to address to crispy nimki coz in Fuska Talmakhana is must ingredient. It is available in Bd. If you buy once,it will stay years(coz needs very little amount). I made fuska with Talmakhana. I had a problem with most of the fuska which had a middle layer and was not fried and so it was hard when became cool. Also some outer shell became soft after frying. What could be the reason? Will appreciate your reply. But overall taste was great. Next time roll it thinner than this time. fry it on slow heat. Thanks for like my recipe and I am very proud to have reader like you. Thanks for sharing it. I have been searching for it. I will try it out at home tonight. Can u plz send me one photo of talmakhna…we have indian shop nearby , they have 2or 3 kinds of,but I am confused which one is that…thanks. আচ্ছা আপু Asteracantha বলতে আমরা যেটাকে তিল বলে চিনি ওইটা নাকি? Til hocche sesame seeds . Asteracantha hochche talmakhana. kothay thaken apni?? Hi, could u pls let me know how do I store the excess fuchkas right after frying them? I appreciate your quick response. Btw, this blog is very rich and worthy. Thanks a lot for ur hardwork..bcoz of u, we r learning to cook abroad and get the taste of deshi flavor. Thank you so much for sharing this recipe. 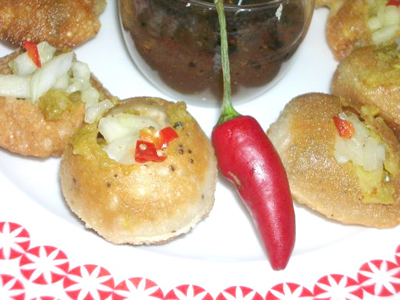 I was looking for a Fuchka recipe with talmakhana which my Boro mami taught me a long time ago but I forgot. I just wanted to ask one thing. Is it true you have to put Talmakhana in water and let it activate for few minutes? And then knead it in the dough mix? Talmakhana works better, if you soak in water first. Can we use phoolmakhana water instead of talmakhana( seeds of lotus)? thnk u apu. Ajk dokandar k ask korate oni bole ekane to tal r pan pawa jyna. Obosso paser dokane pan ace. Ami to tashkit.!!!! Bahaddarhat bazar a mudeer r dokane pelamna. May aro koiekta shop r supermarket a try korte hobe. Hm, ota o try krbo.